The story of a glass that bounced, the Duralex tumbler. This design classic is made of tempered glass and is virtually unbreakable. The original publicity for the glasses in the Fifties claimed that they could be “used as hammers”. 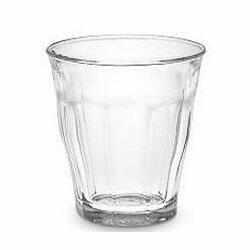 The Duralex tumbler is a favourite glass of American Yuppies but also of Afghan tribesmen. It has been described as the “ultimate drinking vessel created by man”. Its elegant, conical shape has long been recognised as a design classic which says “France” just as much as the Eiffel Tower or a waiter in a long, white apron. At one time the fluted, almost unbreakable, Duralex ‘Picardie’, and its equally tough sister, the straighter Duralex ‘Gigogne’, could be found in every French café, school canteen or works cafeteria. The tumblers were exhibited in art museums; they were the subject of a dozen learned essays on the principles of simple, satisfying, functional design. The original publicity for the glasses in the Fifties claimed that they could be “used as hammers”. They were more often associated with knocking back cloudy glasses of pastis from zinc bars. Duralex glasses spread all over the world and especially to the Middle East (where the smaller ones were regarded as perfect for sipping tea). The tumblers are made in France of heavyweight tempered glass. They’re suitable for serving a variety of hot or cold beverages, from coffee and café au lait to breakfast juices and iced drinks. They are microwavable and dishwasher safe.